This article is about the Polish noble family. For the village in Wisconsin, see Poniatowski, Wisconsin. 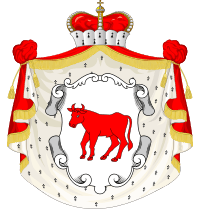 The House of Poniatowski (plural: Poniatowscy) is a prominent Polish family that was part of the nobility of Poland. 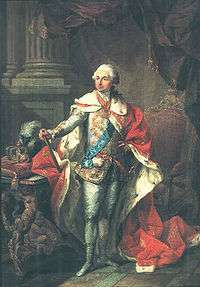 A member of this family, Stanisław Poniatowski, was elected as King of Poland and reigned from 1764 until his abdication in 1795. Since Polish adjectives have different forms for the genders, Poniatowska is the equivalent name for a female member of this family. 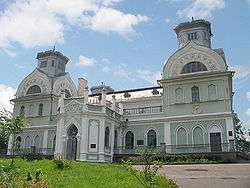 The Poniatowski family became most prominent in the late 18th century and 19th century. In three generations, the family rose from the rank of gentry to that of senator and then to royalty (in an elective monarchy). The first information about the family dates back to the end of the 15th century, when they appeared in Poniatowa, 40 km west from Lublin in about 1446. Their family name derives from that place name. Poniatowa was the residence of several branches of the Poniatowski family: Tłuk, Jarasz and Ciołek. According to the family's history, the family had ties with the Italian nobility: Giuseppe Salinguerra, a member of the Italian family of Torelli, settled in Poland about the middle of the 17th century, and there assumed the name of Poniatowski from the estate of Poniatow, belonging to his wife, who was the daughter of Albert Poniatowski and Anna Leszczyńska. Modern historians however consider this story dubious, particularly as around the 18th century it was fashionable for Polish nobility to have relatives in Italy. On September 7, 1764, at Wola, the most famous member of the family, Stanisław Poniatowski, was elected as King of Poland and Grand Duke of Lithuania. In the same year, the Coronation Sejm awarded the Poniatowski family the title of Prince of Poland. Nowadays, there are still Poniatowscy living in Poland, France, Mexico, Italy, Russia, the United States, Germany, and many other countries in the world. Elena Poniatowska (b. 1932), Mexican journalist, author and professor. The Poniatowski family used the Ciołek arms. 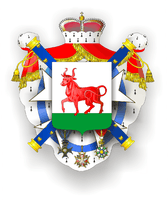 Coat of arms of Prince Józef Poniatowski, Marshal of France, with Order of the White Eagle, Virtuti Militari and Légion d'honneur. No. 304 Polish Bomber Squadron im. Ks. Józefa Poniatowskiego"
Jerzy Jan Lerski; Piotr Wróbel; Richard J. Kozicki (1996). Historical Dictionary of Poland, 966–1945. Greenwood Publishing. 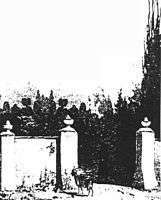 p. 464. Wikimedia Commons has media related to Poniatowski family. "Poniatowski". Encyclopædia Britannica (11th ed.). 1911.